When drought conditions exist, a lawn slows its growth, becomes wilted and brown and may die. If you live in and area where water conservation is requested or enforced, you simply have to hope that your lawn survives the stress. If it dies, replant with a more drought tolerant grass when suitable weather returns. During times of drought, lawns that are under a system of survival watering they still develop a spotty thin appearance. watering during a drought will help your lawn survive. Do not apply nitrogen fertilizer to lawns when drought conditions exist. Mow your grass and higher and less often. However do not let it grow more than twice the recommended mowing height. Irrigate without run off to root zone depth (6 to 8 inches ) when you’re lawn shows the need. There is a difference between a drought stressed brown lawn and a dormant brown lawn. Cool season grasses, such as Kentucky bluegrass or fescue, become dormant in the hottest part of the summer, returning to full vigor in the cooler fall weather. If water is abundant and you started an effective watering program the previous spring, it is possible to keep you’re cool season lawn green during this dormant period. By continuing to water throughout the summer. However, if the lawn becomes dormant, let it stay that way. Too many fluctuations between dormancy and active growth can weaken a lawn. Check with the local weather bureau for climate information. It should be helpful in setting up your specific watering program. Rain gauges are also a useful tool. By knowing how much rain falls, you can tell how much supplemental water you need. Do not be misled by light drizzle’s that supply little moisture to the soil. 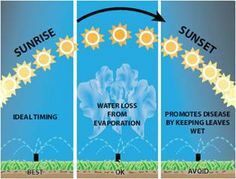 However, watering after a light shower can be an effective way of reducing water loss through evaporation. If drought is a recurring problem, you may want to plant a more drought resistant lawn.